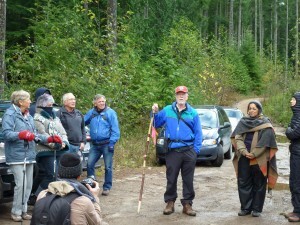 Sunday’s (11/25/2012) Artist Gathering in the Wilson Creek Forest was a success with approximately 35 joining the group at the trailhead for the initial 11:00AM start of the day’s event – 5 to 10 more came later in the day and joined the group walking the trails. We the people want to give special thanks to the Sechelt (shíshálh) First Nation elders that attended – Xwu’p’a’lich (Barb Higgins) and Mus-swiya (Jamie Dixon). The day started with Xwu’p’a’lich calling all to form a prayer/blessing circle and link hands. Both Xwu’p’a’lich and Mus-swiya spoke of these forests with reverence and of the need to protect this forest that lies on their shíshálh people’s traditional land. “Where are the animals – the eagles, the hawks, the ravens, the owls, the crows going to go – and the bears, the cougars, the coyote …Where are they going to go if this forest is destroyed….what about the medicinal plants and the fungi…these will all disappear if this forest is destroyed”, Mus-swiya said (*SEE Biodiversity note at bottom of page). Reached later for further comment Mus-swiya spoke of the need for protection for not only the shíshálh people, but for all of the residents of the communities of Roberts Creek, Wilson Creek, Davis Bay, Selma Park and Sechelt. 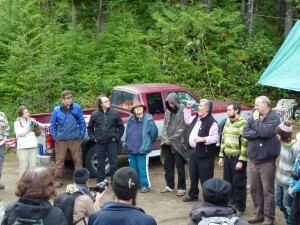 “All of our communities are in support of protection of the Wilson Creek Watershed and this Wilson Creek Forest”, he went on speaking of the hydrological study and fish study that were paid for by the logging company SCCF (Sunshine Coast Community Forest), “regardless of the results of those ‘paid for studies’ you can’t tell me that logging won’t impact our Wilson Creek watershed and spawning grounds. I have seen the impact of logging over the years and the destruction that takes place and the decline in our salmon populations” and added, “Perhaps that approximately $150,000 spent on these two studies would have been better spent on fisheries enhancement rather than to justify their logging”, and “where are our children’s children’s children going to go fishing when our salmon population is depleted”. Barb’s daughter, Holly Higgins, then followed with inspiring words specially written for this occasion. Many thanks to all that participated in the day’s event and to those that worked behind the scenes to make the day a success. Special thanks to local Gibsons’ artists Ed Hill and Shannon Woode. Ed was told about the the Wilson Creek Forest and of SCCF (Sunshine Coast Community Forest logging company) plan’s to log this forest by Shannon. 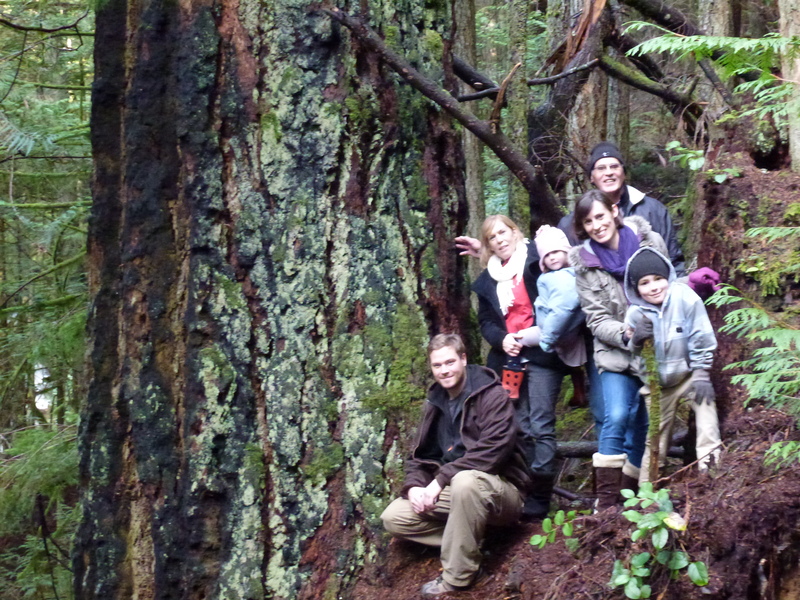 Shannon and daughter Jillian and approximately 30 Homeschooler kids and parents visited this forest just a week before on an education tour. Jillian was one of three homeschooler students that co-organized this event. Immediately afterwards they all saw the need to try and protect this forest and they jumped into action joining in with the effort. 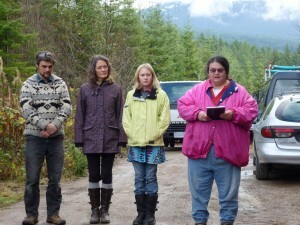 Jillian and her co students have set up and held meetings with Mayor Rowe of Gibsons on Wednesday and on Friday met with Mayor John Henderson of Sechelt (the DoS owns the loging company SCCF that plans to log this forest). Well, they started spreading the word and one of the first Shannon contacted was Ed Hill. Ed, who coincidentally knows this forest well and visits it often, walking the trails and collecting mushrooms, jumped on the opportunity to help and invite the artist community to this forest for their creative inspiration – before it’s too late. Ed composed a poster with an invitation and photo of Mus-swiya by the newly discovered and now his namesake tree “Mus-swiya’s Tree’, the largest tree in this forest and the 2nd largest on the lower Sunshine Coast. This is a call to all Sunshine Coast Artists (painters, writers, poets, singers, craftsman, sculptors, photographers etc.) 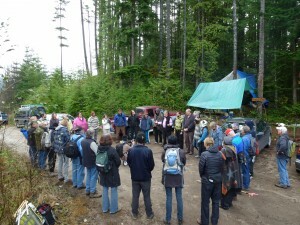 The Wilson Creek Forest (a Community Forest cutblock EW002) is scheduled to be clear-cut in the near future. It’s time for all of those creative people of the Sunshine Coast to gather. That forest needs our positive, creative energy if for no other reason than to preserve it as a memory for our grand children. This is an opportunity for artists to sketch, take notes to complete an art work back at their studio. Works to be displayed at a later date. 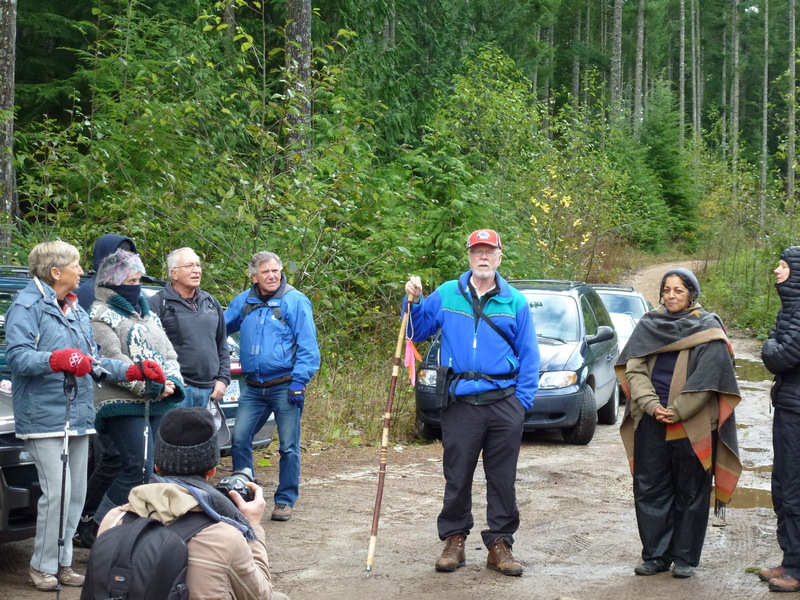 All Sunshine Coast artists are invited to an exclusive walk and tour of this beautiful, pristine forest. 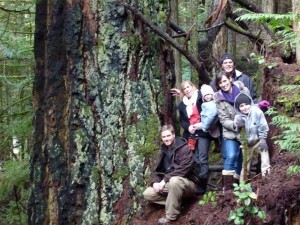 It is home to some of the largest trees on the Sunshine Coast. Update: December 2012 – Many artists works (paintings, poems, sculptures, photographs and songs) have now been completed, with only a few still remaining to be finished. A `Grand Opening`Event and showing, open to the public, of Artists Works is Planned For Early In the New Year. There is still time to submit your work for this event. *Biodiversity: According to Rick O’Neill, a long time Roberts Creek resident and past winner of the Sunshine Coast Conservation Associations’ John Hind Smith Award, we will have at least 5 species of woodpecker living and nesting in this forest, at least 5 species of Owl, 8 species of Amphibians, at least 7 species of flowering forest plants, 2 or more species of reptile, bats, many other species of birds and mammals, dozens or hundreds of mosses, dozens or hundreds of fungi, the list goes on. None of these will live or breed if this forest is logged, for 50 or 60 years, and then it will just begin to support some life.